Finally I am happy to say, I can cook fish!!!. This was my weak point for a long time. I recently tried this delicious Bangda(Meckeral) fry and it was great. As I said earlier, since I am from North Kanara, a coastal area, we used to get very fresh river and sea fish. Unlike my brother, who is a great fan of fish, I seldom liked fish. One small piece of fish, thats all I could eat in a meal. That too, I liked the fried fish more than fish curry. While in India, even though we used to go out and have fish, we never used to order fish fry. The reason being, in almost all restaurants it used to be deep fried one and my brother hated deep fried fish. So we used to wait until we went to our native during some vacations to eat this delicious dish. 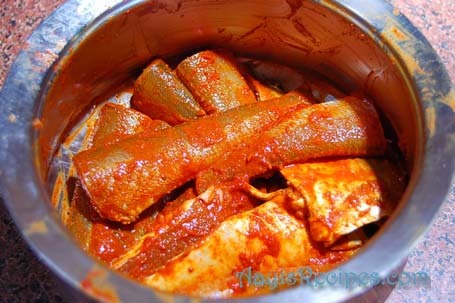 Clean fish and apply crushed garlic, tamarind, chili, salt to the pieces and leave it for around half an hour. Heat tava and put one tea spn oil. Roll the fish in sooji so that there is a coating of it around fish. Fry on a low flame on all sides. Serve hot with rice and Kande tamboli. I like it that you blog about Coastal Karnataka recipes. This is meant to be a constructive suggestion. Try to hold back on the ‘used to’ phrase in your posts. Cool one..I also liked ur egg & veg fried rice..
Yummy! As an incurable fish lover, I can hardly resist that. I have tried this recipe of fish, as i have two of my friends who are konakani’s, so they give me now and then. it looks exact the same way. Anonymous, Thanks for the comment. It looks like I will learn both cooking as well as good English soon because of this blog :).Thanks again. Annita, Sury, lakshmi Thanks a lot. Here is a variation. Hope you like it. Clean and score/light cut fish (I do this on Bangda/Mackarel) and rub a mix of salt and chilli powder. Squeeze a lemon and leave it for marination for about 25/30 mins. Roll the fish in sooji and shallow fry with a tsp of Olive oil (best with coconut oil) and enjoy this HOT HOT fish fry with Rice and Daali toy. Kish, Thanks for the recipe. I will try this soon. Vidya, I have no idea what gabboli is called. Mom used to add the small gabbolis found in small fishes to the ravy, but gaboli fry is very new to me. I will let you know is I could find more about it. Thanks supriya. I will try trout next time. I was very hesitant to try any fishes from American groceries. I did not know how it will turn out.. I will try now …Thanks again. Hey wud like to answer this query which Vidya has.. gabboli in english is Fish Roe (the eggs). the most traditional masala for bangada fry is …. Rice powder, chilli powder, corriander powder, haldi powder, salt and asfoetida water. Make a smooth paste n’ smear it to the fish. just b4 frying roll them in rice powder n’ deep fry them. Rava is usually avoided for Bangda !! Thanks for the English name “fish roe” of Gabboli. I think everyone follows different method for fish fry. The one followed in North Kanara(from generations) is the recipe I have mentioned above. Please give it a try and let me know if you like it. I will try your recipe next time. 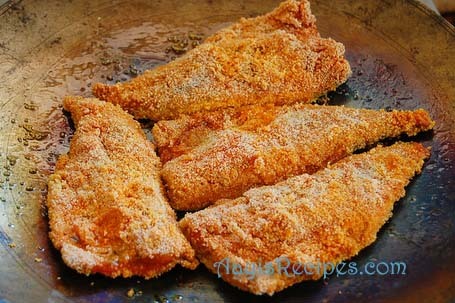 I am not adding rava and ginger to fish fry instead only turmeric,red chilli powder,salt and tamarind.Keep it in fridge in a box.But my problem is when I fry it in oil / deep fry all the coated masala will be in oil…Please tell me how to do fish fry without leaving the masala in oil. The fish fry recipe is great. Dud u add turmeric in it? Bcoz there is a yellow tinge to the fish in the photo. I made fish fry & egg curry(ur recipe) for dinner. It was great. Shilpa: Nimmi, turmeric is added sometimes when the fish has bad smell. But its not mandatory. As i am ‘Malvani’, i know one more way of fish fry which we do. I learnt it from my Aunty. Take whole fish (Bangda or Pomfret) and after removing its head and tail, just give a deep cut to it from one side vertically starting from head to tail. Now preapare a paste of green chillies, corriander, ginger and garlic. (The quantity depends upon number of fish). Add red chillie powder, turmeric, salt and lemon water or tamrind paste to the paste. mix all this well and stuff it inside the fish by using the deep cut given to fish. Apply it outside as well. Keep it for around half an hour and then fry the fish. Shilpa, I tried your masala on a local fish called *Hamour* it was very very tasty indeed! Amma makes fantastic fish dishes but wt garlic n tamarind in, it was new to me! Tks so much for sharing! Pls tell whether you have sliced the Bangda lengthwise ? Does this also need turmeric? I see the yellow turmeric color on the fish. I simply love your recipes. I ahve tried so many of them all have turne dout to be great . I recently bought smelt fish here ( am in US btw) . I read soem where its very much similar to the manglorean motyale . Is this true? What kind of preparation should i make this fish in? Any tips ? What all kind of fishes here can we use for indian cooking. I generally use tilapia . Please advise. & Continue posting these great recipes. You rock !! Shilpa: Sorry, I have no idea what Smelt fish is. I have used only tilapia and cat fish for Indian cooking so far. great pictures! looks sumptious! I make rava fry using a little hing! I am from Kolhapur area and my dad used to always get fish for me when he visited the Kokan area. I am a die hard fan of Konkani food and with your recipes, i can enjoy fish once again konkani style even though am in USA. Hearty Thanks for all the recipes and keep up the good work. PS – i have tried the tilapia in spices, shirmp curry, fried fish and many many more. Daali thoy is my hubby’s fav. i went thro’ your bangda recipe which is simple and easy.I personally feel this recipe will taste good only with fresh fish which u get in goa ,karwar and kumta.I stay in chandigarh where fresh fish is a dream to get.I prepare it the following way to camoflage the smell. :-1 tbsp coriander,1tsp jeera,4 to 6 peppercorns,6 red chilli,5to 6 garlic flakes,1/2 inch garlic,haldi 1/2 tsp,pinch of hing,sali,lemon juice or tamarind.grind it into paste.can store in the fridge.tastes yummy with fresh fish.will try ur recipe in goa(in laws place). I REGULRLY go thro’ ur recipes and enjoy it. Gaboli is fish eggs, and Smelt fish tastes like our Indian Tarle.. I cooked it when I was in US and my son and husband loved it, specially, the above given fried fish recipe, as also sukkhe.When in US one must get the available fish and try to cook our recipes, they indeed taste good, though I’ve not tried cat fish. I tried this recipe to the point. The fish tasted good but I didnt get the thick coating as in your pics. how do I get it thick? I use Tilapia Filets for frying. hey.. I am referring to the thick coat of the masala on the fish prior to adding the sooji.. 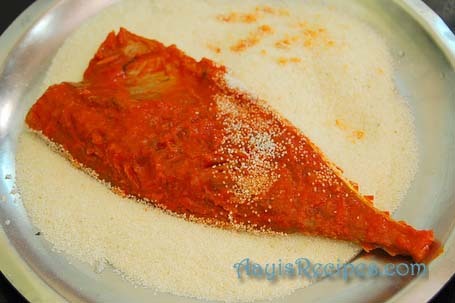 I would appreciate if you post recipe of Fish Masala Fry. 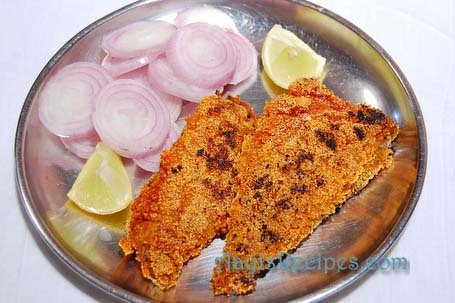 As you know in goa any of the restaurants mainly two types of fish fry is available, either rawa fry or masala fry. I need the recipe of Masala fry. Hi Shilpa, love the recipes on your blog. Have tried several and they’ve always come out delicious. But every time I’ve done the fish fry (with surmai fish), the sooji covering separates on frying. It doesn’t stick to the fish as in your picture! What am I doing wrong?? i like to bite it, this receipes i am going to try on thid sunday. the writers and readers. I’m a foodie love to cook n eat it too.